Today, Our Lady of the Lake Children's Hospital located in Baton Rouge, Louisiana broke ground on a new, state-of-the-art hospital that will serve as a premier destination for high-quality, advanced medical care for children within a statewide network of pediatric healthcare excellence. "After more than a decade of planning, the strategic vision to design and build a hospital that will change the lives of Louisiana's children is coming to fruition. We know that children have unique needs and require specialized care in an environment built just for them," said Scott Wester, chief executive officer, Our Lady of the Lake. "Our goal is to build a hospital that will further advance care and research for children through greater recruitment of pediatric specialists, continue to growth our successful pediatric residency program that trains future Louisiana pediatricians, and capitalize upon strategic partnerships like that of our relationship with St. Jude Children's Research Hospital." Children's healthcare is unique and for decades, Our Lady of the Lake Children's Hospital has been a leader in pediatric care in the region and one of the largest providers of pediatric care in the state. Each year the hospital provides care to approximately 100,000 patients from all across Louisiana, parts of Mississippi, Texas and beyond and is committed to healthcare education and keeping children healthy. "Children make up nearly twenty-five percent of Louisiana's population and these children are our future. We recognize our role and responsibility to provide the necessary tools for our youth to grow into healthy adults," said Dr. Shaun Kemmerly, chief medical officer, Our Lady of the Lake Children's Hospital. "We are committed to positively impacting the long-term health of the state and to do this we must begin with children. With this new facility we can continue to grow the resources for ongoing education for children to create lifestyle changes and to build healthy habits to break the risk cycles of chronic illnesses such as diabetes, hypertension and obesity. Healthy children grow into healthy adults." "Our Lady of the Lake Children's Hospital currently has approximately 60 pediatric medical subspecialists providing care in about 20 different medical specialties including gastroenterology, pediatric surgery, pulmonology, hematology/oncology and many others," said Nicole Telhiard, vice president of patient care services, Our Lady of the Lake and administrator, Our Lady of the Lake Children's Hospital. "This new hospital will help us attract more subspecialists and medical specialties, increasing our capabilities to offer advanced medical care and allowing more children to receive excellent care close to home." Currently Our Lady of the Lake Children's Hospital offers pediatric specialty care across the state. In addition to Baton Rouge, Our Lady of the Lake Children's Hospital Pediatric Specialty clinics are located in Hammond, Gonzales, Lafayette and Monroe. Our Lady of the Lake Children's Hospital currently operates as a hospital within a hospital model inside Our Lady of the Lake Regional Medical Center. 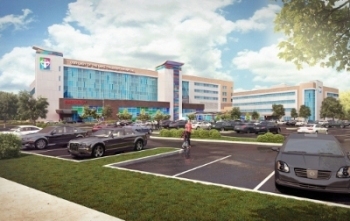 A new freestanding Our Lady of the Lake Children's Hospital will be built on 66 acres of property that runs parallel to I-10 in between Essen and Bluebonnet near Our Lady of the Lake's main campus in Baton Rouge. Estimated construction cost for the hospital and medical office building is $230 million. The project is expected to be complete in late 2018. Philanthropy supports this construction project and ongoing health and wellness programs. "To date we have raised half of our initial goal of $50 million but fundraising is ongoing and will not stop once we reach our goal," said John Paul Funes, president, Our Lady of the Lake Foundation. "Philanthropy plays an important role in most children's hospitals and allows hospitals to purchase life-saving equipment, invest in programs that benefit the health and wellness of all patients and purchase unique and special items that help make the hospital and its treatments and procedures less scary for patients."